Piano practice is essential in maximizing the investment you’ve made in your child’s music education. Without practicing, improvement is stunted, you and your child get frustrated, and the teacher has hit a brick wall. As the saying goes, “Practice makes perfect.” No, not quite. Rather, persistent practice makes progress. Persistent practice will strengthen your child’s will to learn, build confidence, and enhance their curiosity and interest in music. Keep the guide below handy for children when implementing an effective practice process. Pledge commitment to their music education. Children respond quite well to verbal affirmations of commitment. Recall the children’s book, “The Little Engine That Could,” and the persistent, optimistic mantra of “I think I can” as he chugs to pull a train over a mountain. Just like that little engine, our children need to say, “I can do this” as a verbal reminder that with hard work and determination, they can achieve their goals. Practice, don’t just play. Children can slip into a habit of “playing” the piano instead of practicing. Unbeknownst to parents, the notes that are seemingly progressive in nature are actually the child avoiding hard parts. In order to fix this, students should follow the Three S’s Rule: Slowly, Separately, and Sections. According to Graham Fitch, pianist and teacher, dividing pieces into sections will help a child set attainable, but challenging goals. Playing those sections hands apart helps a student focus on technical and musical elements, one hand at a time. Finally, playing slowly will allow the brain to analyze the selected passage and increase note accuracy. Practice problem spots first. After your child warms up, they should begin with their hardest pieces and most difficult sections. I typically circle or use brackets around these sections in my students’ music. Putting the energy and focus into these spots will allow for more effective use of practice time. Remember: it’s better to have short and sweet practice sessions, rather than lengthy, monotonous ones. By starting each session with problem spots, your child is guaranteed to make more noticeable progress. Turn on Auto-pilot. There is no such thing as practicing too much. Cognitive psychologists have noted that the key to mastering a skill is not just to learn it, but to overlearn it. The neural connections in our brain are constantly firing with each repetition of a musical phrase. Overlearning a piece helps to free up the energy necessary to inject more musicality, emotion, and passion. This is when you know they’ve reached the “auto-pilot” stage of mastery. They can just play without a lot of thinking, giving them a real chance to connect with the music. Have a pop performance. Teachers love to throw a surprise “pop quiz” on you during a class going over a concept you learned earlier that week. Pop performances are similar, in that when given the chance to perform, most music students, albeit hesitantly, will oblige. The adrenaline is just enough to put the child to the test. This is called the “audience effect,” and can lead to better performance. Call the elderly next door neighbor, invite the grandparents over for coffee, or have your child’s best friends over for a jam session. Giving your child a chance to show off a little will give them just the right amount of nerves and confidence to keep mastering the piano. Sound off: What tips can you give a beginner piano student to make practicing more interesting? How long are your practice sessions? When did you find you were most motivated to practice? Choosing your Instrument: Acoustic or Digital Piano? Here in the Houston Metroplex, we are lucky to have such a supportive arts and music community. The market for used acoustic pianos is relatively good, and piano lessons are something that most parents seek out for their children at some point in their childhood. But in choosing between a digital and acoustic piano, several factors come into play. Follow this easy guide to see which instrument will work best for you and your family. Do you have the space required for a full acoustic piano? They are heavy, difficult to move, and take up a good amount of space. An upright piano would be more easily placed in a smaller room than a baby grand/grand piano, which requires a large space to hold the instrument. A digital piano is much smaller and more portable than an acoustic piano, making it a good choice for a beginner. They can keep the instrument in their bedroom/living room, without it taking up too much space. How important is the quality of sound and feel to you as a piano student? Acoustic pianos will always be the preferred choice of piano teachers across the country, just for their authenticity of sound in the hammer action and the subsequent string vibrations after pressing a key. This is the heart of the piano. Digital pianos have certainly come a long way in their software, but they will still just be electric instruments. There is no hammer/string action and no vibrations within the piano. The tone quality and sound in higher tier digital pianos comes very close to sounding like the real thing, but the action in playing doesn’t quite feel the same. Can you afford the maintenance necessary for an acoustic piano? Keeping an acoustic piano regularly tuned is very important for the life of the instrument. According to the Piano Technician’s Guild, if you purchase a new acoustic piano, it should be tuned two to four times the first year, and one to two times annually after that. If you purchase a used acoustic piano, you should tune it a few months after it has been moved into its permanent spot in your home to give it time to settle into its climate/environment, and annually from thereafter. Check out this guide to help determine your piano’s tuning schedule from the manufacturers. Digital pianos require no tuning, therefore are a significantly more cost-effective choice regarding maintenance. 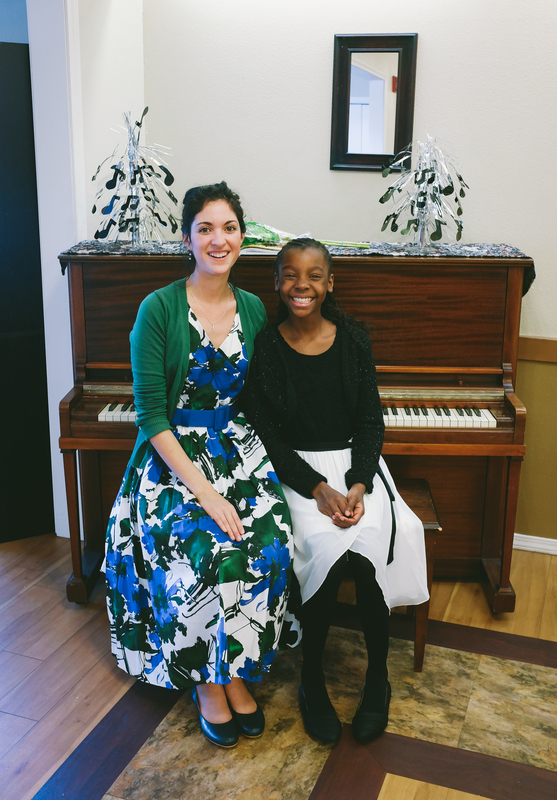 Are you comfortable with the melodious and “not so melodious” music coming from your budding pianist? All piano students make mistakes. Lots of them. This is all a part of learning and mastering the instrument! If you feel that volume controls are something that would be important for you as a parent/student, then make sure to look into a digital piano. All digital pianos have a convenient volume control and headphone jack that allows for students to practice quietly and comfortably in their home without causing major dissonance. Most digital pianos have a recording function as well, so the student is able to record and then listen to their practice sessions. How much of an investment are you willing to make for yourself/your child? Acoustic pianos are expensive. New, they can cost anywhere between $5,000 and $15,000. You can probably find a good used acoustic piano anywhere between $1,000 and $5,000. Acoustic pianos become heirloom instruments, passed down to family members, and can last upwards of 100+ years! Imagine the gift of music you will be giving not just your child, but your family for generations to come. My family has three heirloom pianos, two of which are over 130 years old! Digital pianos are more affordable, ranging in price from $800 to $3,000. There are several digital pianos in my Amazon Music Store which I personally recommend. Whichever piano you decide to purchase, make sure it is the best choice for your unique needs as a family. Sound Off: Do you have an heirloom piano in your family? What are your favorite things about a digital piano? What other reasons can you think of to go with an acoustic or digital piano? Encore Music Studio put on a great show this weekend! 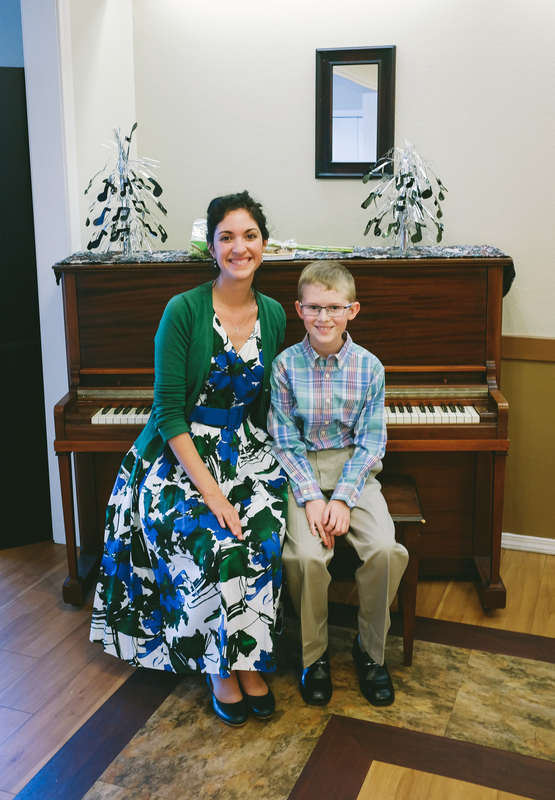 Each student performed one or two musical selections, and worked through their nerves to perform for family, friends, and the residents at Bluebonnet Place, a local assisted living facility for the elderly. Pieces included Ode to Joy, Sleigh Ride, Grandpa’s Clock, Kum-Ba-Yah, Away in a Manger, Silent Night, The Can-Can, Air from Overture in D Major, O Little Town of Bethlehem, Schumann’s Little Piece, Waltz from Sleeping Beauty, and Raindrop Prelude by Chopin. 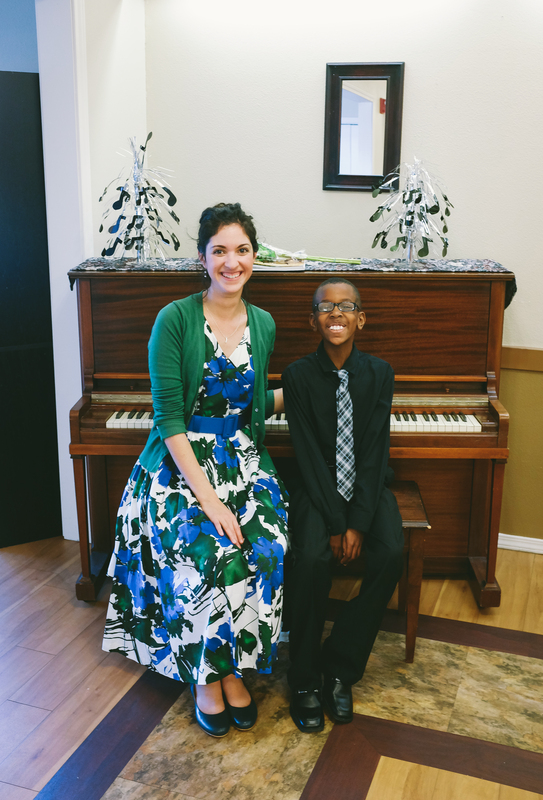 Students each achieved their Encore performance credit for a successful recital. I look forward to their continued success in the months to come!